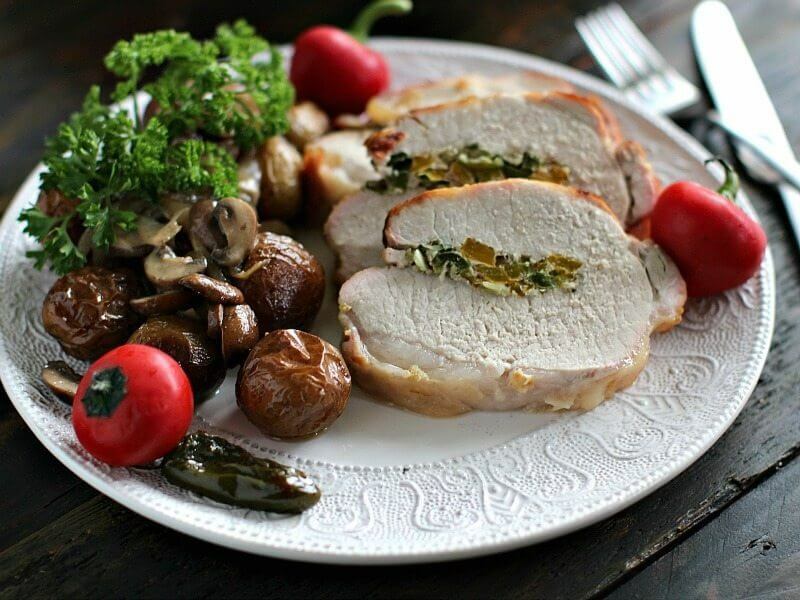 Garlic Jalapeno Stuffed Pork Loin is soft and tender, with spicy jalapenos and lots of garlic, cooked in a white wine broth and served with roasted garlic baby potatoes. We love making delicious Pork meals in our kitchen like Pineapple Pork Loin, Bacon Wrapped Pork Tenderloin and Garlic Pork Tenderloin. 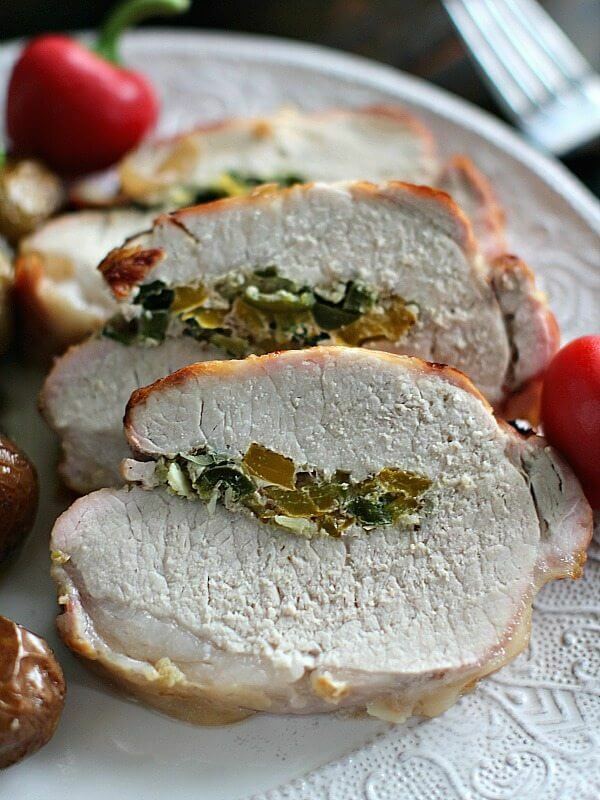 Stuffed Pork Loin are budget friendly and you can cook them in so many delicious ways. 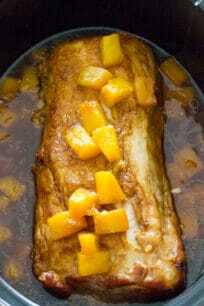 Also, its worth mentioning, that they are easy to prepare and most recipes for pork loin are hassle free. 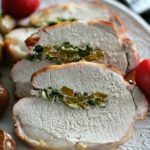 This Garlic Jalapeño Stuffed Pork Loin is no exception, it requires easy and affordable ingredients and its very easy to make. Most of the time I like to cook the pork loin in the slow cooker, but I decided to change things and spiced them up a bit with this stuffed pork loin version. In our house we love garlic, my husband makes the most amazing Garlic Shrimp that you definitely must try. I decided to use our beloved ingredient in a stuffed pork loin version. The pork lion is stuffed with spicy jalapeños for some heat. The leftovers where delicious as well, you can reheat them or just slice the pork loin and make sandwiches. 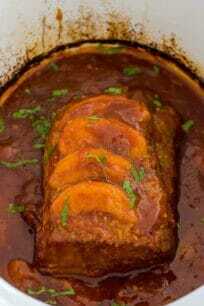 Definitely keep the sauce after cooking, I stored my pork loin in the leftover wine sauce, to make sure it stays juicy, soft and tender. The area between the shoulder and back legs is the leanest, most tender part of the animal. Pork loin roasts are cut from this area. These cuts will be dry if overcooked, so keep an eye on it, if cooked the right way, the meat will be juicy and tender. How to Butterfly a Pork Loin? Use a sharp knife to make a vertical cut along the lengthwise portion of the pork loin. Stop the vertical cut about 1-inch from the end of the pork loin. Open the cut meat and lay flat. Pound the meat until it is of even thickness, about 1/3-inch thickness. Chill meat while preparing stuffing. With a sharp knife, cut the pork loin horizontally until you can open it like a book. Season it with 2 tablespoons of olive oil, salt and pepper. Rub 2/3 of the minced garlic into it. Remove the seeds from 5 jalapeños, chop them. Arrange the chopped jalapeños, bell pepper and spicy red pepper down the pork, horizontally, in a thick line, closer to the middle. Roll one side of the pork over the stuffing and tightly tie the pork roast up with butcher's twine, season it with more salt and pepper, trim the fat and transfer to a roasting pan. Add the white wine, water, 6 garlic cloves, 1 halved onion, 1 large halved carrot, 2 whole jalapeños, a little salt and pepper to the pan. 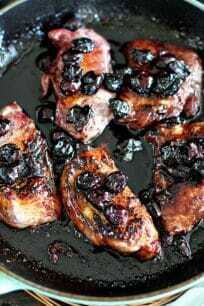 Brush the pork with 1 tablespoon of olive oil and roast in a preheated oven for about 90 minutes or until an instant-read thermometer registers 160 degrees F. Remove from the oven and let rest for 15 minutes before slicing. In another roasting pan, mix together potatoes with 5 tablespoons olive oil the remaining 1/3 of minced garlic, salt and pepper and add to the oven when the pork has 60 minutes more of cooking. After 30 minutes, using a spatula mix the potatoes and return to the oven. In a medium skilled over medium heat add the olive oil. When the oil is hot add the sliced onion and cook for 3-5 minutes until it starts to turn golden brown. Add the sliced mushrooms, stir and cook for 7-8 minutes. Season with salt and pepper as needed. 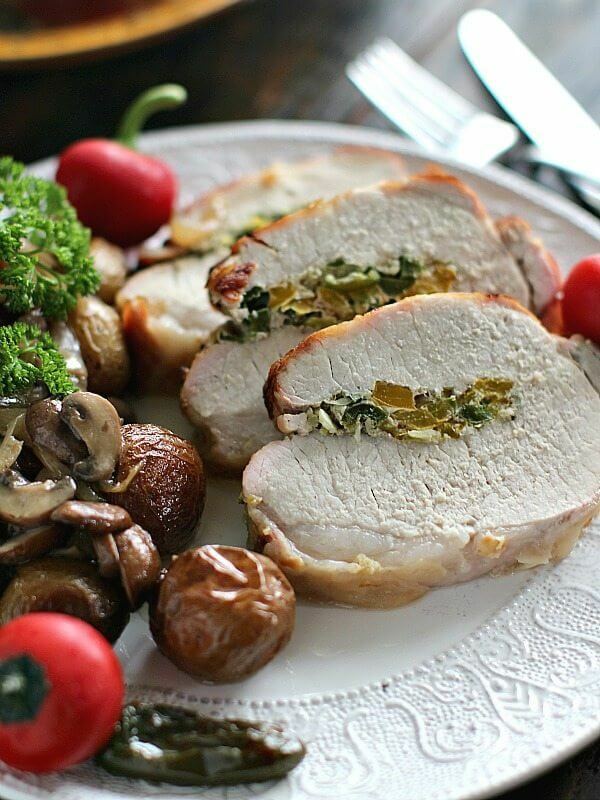 Slice the pork loin, serve with roasted potatoes and caramelized mushrooms. Garnish with fresh chopped parsley. So succulent and tender…must be really yum with that garlic jalapeno stuffing!